LIST OF MUSEUMS IN CANADA - Wikipedia. Canadian Museum of Civilization - Gatineau, Quebec. 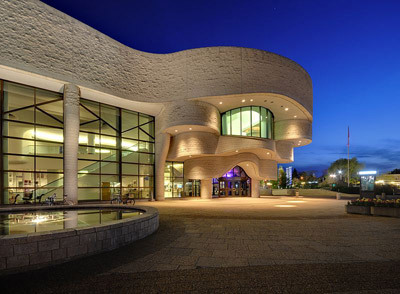 Canada's national museum of human history. Canadian War Museum - Ottawa, Ontario. "An entirely new and must-see attraction, this national museum presents Canada’s military past and how it shaped the country. Its outstanding exhibitions explain Canada s rich military history from earliest times to the present, featuring the experiences of people on the battlefields and at home." Royal Ontario Museum - Toronto, Ontario. Canada's largest museum of world culture and natural history. LIST OF MUSEUMS IN MEXICO - Wikipedia. CHICHEN ITZA - Yucatán Peninsula, Municipality of Tinúm, Yucatán. National Museum of Anthropology - Mexico City. The most visited museum in Mexico. 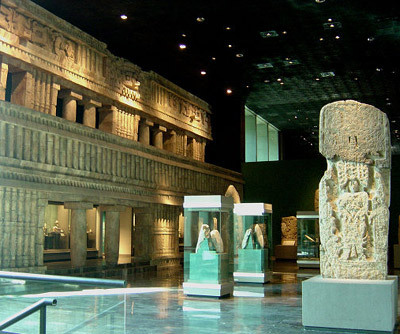 The museum contains significant archaeological and anthropological artifacts from the pre-Columbian heritage of Mexico, such as the Piedra del Sol (the "Stone of the Sun" or Aztec calendar stone) and the 16th-century Aztec statue of Xochipilli. Teotihuacan - the Temple of the Feathered Serpent is the modern-day name for the third largest pyramid at Teotihuacan, a pre-Columbian site in central Mexico. 11 most endangered historic places in America – in pictures - The Guardian. How to Get the Most out of New York’s Met Museum - The New York Times. List of largest historic homes in the United States - Wikipedia. LIST OF MUSEUMS IN THE UNITED STATES (BY STATE) - Wikipedia. MUSEUMS IN THE U.S.A. - Alphabetic Listing (1507 museums). NATIONAL MUSEUM OF AFRICAN AMERICAN HISTORY & CULTURE - The New York Times. The real story behind some of America’s most iconic places - "Mount Rushmore, Lincoln Memorial, Statue of Liberty: Story behind iconic places." The secret rooms inside America’s most popular attractions - The Telegraph. Wild luxury of America's opulent Hearst Castle - "15 secrets of Hearst Castle." World's biggest dinosaur skeleton unveiled in New York - The Guardian. 9/11 MEMORIAL & MUSEUM | WORLD TRADE CENTER MEMORIAL - World Trade Center site, Liberty Street & Church Street, New York City, NY 10048. The principal memorial and museum commemorating the September 11 attacks of 2001. ADRIENNE ARSHT CENTER - Miami, FL. AMERICAN MUSEUM OF NATURAL HISTORY - New York, NY. One of the largest and most celebrated museums in the world. Located in park-like grounds across the street from Central Park, the museum complex contains 27 interconnected buildings housing 45 permanent exhibition halls, in addition to a planetarium and a library. The museum collections contain over 32 million specimens of plants, animals, fossils, minerals, rocks, meteorites, and human cultural artifacts. Also on display is the 563 carat (113 g) Star of India, the largest, and most famous, star sapphire in the world. Bishop Museum - founded in 1889. Museum of history and science located in the historic Kalihi district of Honolulu on the Hawaiian island of O'ahu. It is the largest museum in Hawai'i and is home to the world's largest collection of Polynesian cultural artifacts and natural history specimens. BRANSON MISSOURI - Titanic Museum: "World's largest museum attraction." CIA MUSEUM - Langley, VA. The museum is closed to the public and is only visited by employees and invited guests. CORAL CASTLE MUSEUM - Miami, FL. Country Music Hall of Fame and Museum - Nashville, TN. Identifies and preserves the evolving history and traditions of country music and educates its audiences. CREATION MUSEUM - creation, evolution, science and Christian worldview. Ellis Island - designated October 15, 1966. "12 million immigrants who passed through these now quiet halls from 1892 to 1954." Upper New York Bay. EMPIRE STATE BUILDING - 350 Fifth Avenue, New York City, NY 10118. Ernest Hemingway Home & Museum - 907 Whitehead Street, Key West, Florida. Hemingway's home from 1931 to 1939, although he retained title to the home until he died (1961). Flagler Museum - Palm Beach, FL. FORD'S THEATRE - 511 Tenth St, NW, Washington, DC. "Where Lincoln's Legacy Lives." GEORGE EASTMAN HOUSE - the world's oldest museum dedicated to photography and one of the world's oldest film archives, opened to the public in 1949 in Rochester, New York. GRAMMY MUSEUM - 800 W. Olympic Blvd., Los Angeles, CA. GUGGENHEIM MUSEUM - New York City, NY. HARLEY-DAVIDSON MUSEUM - Milwaukee, WI. HENRY FORD MUSEUM - 20900 Oakwood Blvd., Dearborn, MI. "America's Greatest History Destination." Henry Morrison Flagler Museum - 1 Whitehall Way, Palm Beach, Florida. Fifty-five room Beaux Arts estate known as Whitehall, the home was Florida's first museum. Hillwood Estate, Museum & Gardens - 4155 Linnean Ave NW, Washington, DC 20008. Decorative arts museum since 1973. The former residence of businesswoman, socialite, philanthropist and collector Marjorie Merriweather Post, Hillwood is known for its large decorative arts collection that focuses heavily on the House of Romanov, including Fabergé eggs. Other highlights are 18th and 19th century French art and one of the country's finest orchid collections. International Center of Photography - since 1974. Photography museum. 1133 Avenue of the Americas at 43rd Street, Manhattan, New York, NY 10036, U.S.A.
International Spy Museum - since 2002. Washington, DC, U.S.A. The Museum features the largest collection of international espionage artifacts ever placed on public display. It is the only public museum in the United States solely dedicated to espionage and the only one in the world to provide a global perspective on an all-but-invisible profession that has shaped history and continues to have a significant impact on world events. Intrepid Sea, Air & Space Museum - military and maritime history museum with a collection of museum ships in New York City. It is located at Pier 86 at 46th Street on the West Side of Manhattan. The museum showcases the World War II aircraft carrier USS Intrepid, the submarine USS Growler, a Concorde SST and a Lockheed A-12 supersonic reconnaissance plane. Additionally on April 12, 2011, the museum was awarded the Space Shuttle Enterprise. JOHN F. KENNEDY PRESIDENTIAL LIBRARY AND MUSEUM - Boston, MA. Madame Tussauds Hollywood - "Meet the icons." 6933 Hollywood Blvd. Madame Tussauds Las Vegas - 3377 Las Vegas Blvd South, Suite 2001. Madame Tussauds New York - 234 W 42nd St.
Madame Tussauds San Francisco - 145 Jefferson St.
Madame Tussauds Washington - 1001 F St NW. MARK CROSS objects at Metropolitan Museum of Art - "America's Original Luxury Lifestyle Brand." METROPOLITAN MUSEUM OF ART - New York City, NY. MOCA | THE MUSEUM OF CONTEMPORARY ART - Los Angeles, CA. Morgan Library & Museum - museum and research library located at 225 Madison Avenue at East 36th Street in the Murray Hill neighborhood of Manhattan, New York City. It was founded to house the private library of J. P. Morgan in 1906, which included manuscripts and printed books, some of them in rare bindings, as well as his collection of prints and drawings. MOUNT RUSHMORE - Keystone, SD. Museum of American Finance - the nation’s only independent public museum dedicated to preserving, exhibiting and teaching about American finance and financial history. Located in the Financial District of the Manhattan borough of New York City, New York, it as an affiliate of the Smithsonian Institution. MUSEUM OF FINE ARTS - Boston, MA. Museum of Flight - since 1965. The largest private air and space museum in the world. King County International Airport (Boeing Field), 9404 E. Marginal Way, Tukwila, Washington, U.S.A.
Museum of Jurassic Technology - Los Angeles, CA. The museum calls itself "an educational institution dedicated to the advancement of knowledge and the public appreciation of the Lower Jurassic"; the relevance of the term "Lower Jurassic" to the museum's collections is left uncertain and unexplained. The museum's collection includes a mixture of artistic, scientific, ethnographic, and historic, as well as some unclassifiable exhibits, and the diversity of its offerings evokes the cabinets of curiosities that were the 16th century predecessors of modern natural history museums. Museum of the Moving Image - Astoria, NY. The Museum of the Moving Image exists to expand public understanding and appreciation of the art, history, technique and technology of film, television, and digital media by collecting, preserving, and providing access to moving-image related artifacts via multimedia exhibitions and educational programming. The exhibits include significant audio/visual components designed to promote an understanding of the history of the industry and an understanding of how it has evolved. MUSEUM OF TOLERANCE - Los Angeles, CA. A Simon Wiesenthal Center Museum. MY AL CAPONE MUSEUM - gangster memorabilia. National Building Museum - Washington, D.C. Since 1985: "Telling the stories of architecture, engineering, and design." Museum of "architecture, design, engineering, construction, and urban planning". National Museum of African American History and Culture | NMAAHC - Smithsonian Institution museum established in 2003. Currently under construction on the National Mall in Washington, D.C..
NATIONAL MUSEUM OF AMERICAN HISTORY - 14th St and Constitution Ave, NW, Washington, D.C.. Collects, preserves and displays the heritage of the United States in the areas of social, political, cultural, scientific and military history. Among the items on display is the original Star-Spangled Banner. NATIONAL SEPTEMBER 11 MEMORIAL & MUSEUM | 9/11 Memorial - World Trade Center Memorial. World Trade Center site, Liberty Street & Church Street, New York City, 10048 NY. The principal memorial and museum commemorating the September 11 attacks of 2001. NEW YORK TRANSIT MUSEUM - largest museum in the United States devoted to urban public transportation history. NEWSEUM - interactive museum of news and journalism located at 555 Pennsylvania Ave. NW, Washington, D.C. The seven-level, 250,000-square-foot (23,000 m²) museum features 15 theaters and 14 galleries. The Newseum's Berlin Wall Gallery includes the largest display of sections of the Berlin Wall outside of Germany. The Today's Front Pages Gallery presents daily front pages from more than 80 international newspapers. PENN MUSEUM of Archaeology and Anthropology - Philadelphia, PA.
SIXTH FLOOR MUSEUM (AT DEALEY PLAZA) - located on the sixth and seventh floors of an early 20th-century warehouse known in 1963 as the Texas School Book Depository. Chronicles the assassination and legacy of President John F. Kennedy. 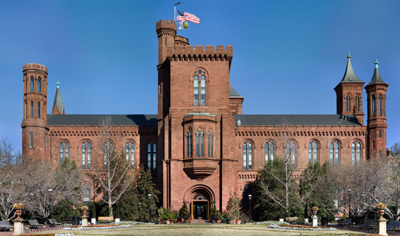 SMITHSONIAN INSTITUTION - 1000 Jefferson Dr SW, Washington, DC 20004. "Seriously Amazing." The world's largest museum complex and research organization composed of 19 museums, 9 research centers, and the US National Zoo. Termed "the nation's attic" for its eclectic holdings of 137 million items. 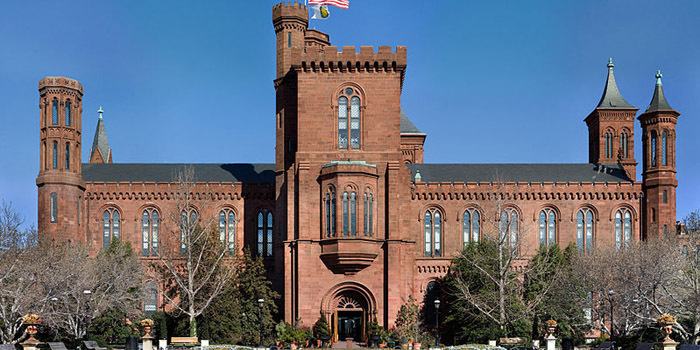 Established in 1846 "for the increase and diffusion of knowledge," is a group of museums and research centers administered by the United States government. Statue of Liberty - dedicated on October 28, 1886. Liberty Island, Manhattan, New York City. STEVEN F. UDVAR-HAZY CENTER - Smithsonian National Air and Space Museum, 14390 Air and Space Museum Pkwy, Chantilly, VA 20151, U.S.A. Displays historic aviation & space artifacts, including: the Enola Gay, the Boeing B-29 Superfortress that dropped the first atomic bomb on Hiroshima, Japan & an Air France Concorde supersonic airliner. THE ART DECO WELCOME CENTER - Miami, FL. Guided walking tours. Non-profit organization devoted to preserving, protecting, and promoting the cultural, social, economic, environmental and architectural integrity of the Miami Beach Architectural Historic District. The Cloisters - museum located in Fort Tryon Park in the Washington Heights section of Upper Manhattan, New York City. It is a branch of the Metropolitan Museum of Art, used to exhibit the museum's extensive collection of art, architecture and artifacts from Medieval Europe. THE GETTY VILLA - Malibu, Los Angeles, CA. THE J. PAUL GETTY MUSEUM - Los Angeles, CA. The Mob Museum - Las Vegas, NV. Dedicated to featuring the artifacts, stories, and history of organized crime in the United States. E.g. the St. Valentine’s Day Massacre Wall are a Tommy gun (which can be touched, held and even “pretend” shot), an electric chair, as well as the barber chair Albert Anastasia was murdered in. UNITED NATIONS GUIDED TOURS - New York City, NY.